What’s more delightful than a bouquet of fresh flowers? Only one thing. A bouquet of free fresh flowers. Which is one reason I adore this time of year. Sure, it’s hot. Dang hot. But the heat and humidity bring with them a stunning variety of wildflowers. Or “ditch flowers” as I like to call them, since so many of them grow in hard-to-reach spots on the side of the road. My quest for free flowers begins in March, when daffodils poke up their heads in fallow fields that, a long time ago, were most likely somebody’s yard. Meaning that daffodils aren’t really wildflowers since they come from deliberately planted bulbs. But if there’s no house in sight (a stand-alone crumbling chimney doesn’t count), I consider them wild. And gather them with reckless abandon. My favorite April bouquet is violets, both purple and white, which grow by the millions anywhere there’s shade. Though too petite for a table arrangement, they’re charming in tiny bud vases scattered all over the house. Then comes May, the month to stick sprigs of fragrant honeysuckle into interesting glass bottles. And to fill quart-size Mason jars with oxeye daisies, which my maternal grandmother called “May daisies.” These he-loves-me, he-loves-me-not flowers have always been one of my favorites. Just about the time the daisies wither and fade, the real show begins. It’s high summer, when ditch flower-picking must be reserved for early morning or late afternoon to avoid heat prostration. Before the flies getting to buzzing good, I pull on knee-high boots (snakes like wildflowers, too) and stuff a left-hand leather work glove into my shorts pocket (more about that later).Then I take the cheap scissors from their drawer, half-fill a plastic pitcher with cold water and head out the door. From my bicycle, I’ve already scouted out where the best flowers grow. Black-eyed Susans by the hundreds between rows of my neighbor’s nursery stock. Red clover in my own horse pasture. Trumpet vine, sometimes called horn bush, smothering a rotting fencerow. Butterfly weed on the far side of a steep drainage ditch. (Precarious, but worth the effort.) Queen Anne’s lace, known as chigger weed by those unconvinced of its charm, everywhere. Finally, I turn my attention to the ditch flower that’s the reason I brought along a leather glove. 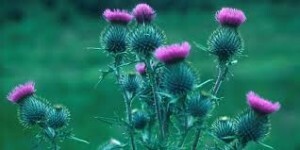 Bristle thistle. Tall, purple, and gorgeous. And exceedingly painful when touched with bare skin. I watch as the goldfinches who love to feast on it fly away. Then I grasp the prickly stem with my gloved left hand and snip it with the scissors in my right. This flower will be the first to go as my bouquet ages. Like a dandelion, its bloom will soon morph into feathery white wisps that will scatter with the slightest breeze. But for a few days, it will be the highlight of my bouquet. Come September, most of these high summer flowers will be spent and hard to find. Some will be gone altogether. But in their place will be goldenrod and iron weed and magnificent Joe Pye weed. Flowers too tall for a table bouquet, but perfect to set in a sturdy metal bucket beside the front door. Ditch flowers, free for the taking. What could be more delightful?